After a lay off due to injury, indifferent form in international cricket, and a lackluster PSL, Mohammad Hafeez is back in Pakistan's ODI and T20 squads for the West Indies. Not many people are thrilled with his inclusion. He used to draw plenty of criticism while he was performing, so one can only imagine the criticism he must be receiving right now when he has not been at his best. I, however, am thrilled with his inclusion. I am also thrilled because he liked my tweet, which questioned his critics. 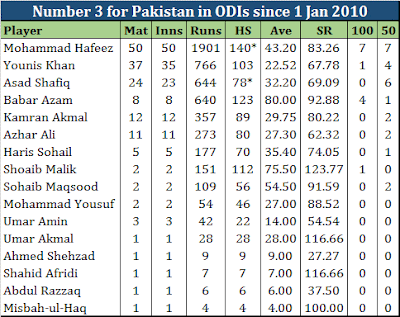 Besides Azhar Ali and Sarfaraz Ahmed, no one has a better average in ODIs as an opener for Pakistan in past 7 years. We all know the fate of poor Azhar Ali, and I guess Sarfaraz can't also open given his role as captain and wicket keeper! Or can he? 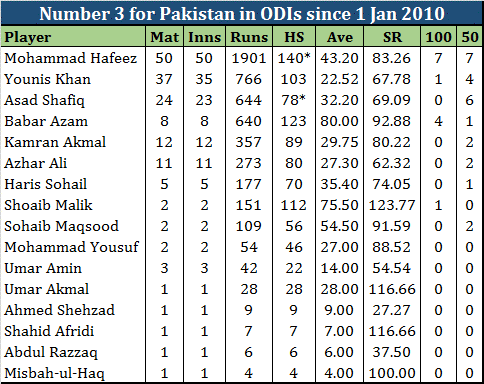 At number 3, Hafeez' performance is even more impressive. No one even comes close to him in terms of the runs and centuries he has piled on from this position (besides the majestic Babar Azam ofcourse). His average and strike rate also better at this position. 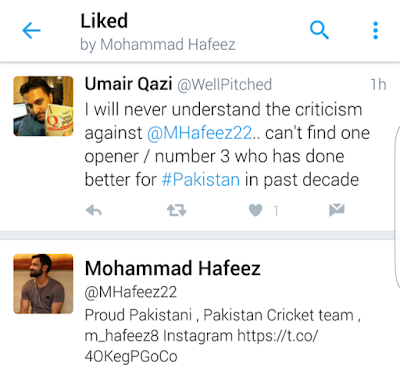 As I tweeted earlier, I will never understand the criticism against Mohammad Hafeez. He has always been valuable as a top order batsman, and now with his bowling, he is even more key for Pakistan.